On 4 April 2017, the University of Bristol hosted a workshop on local communities as part of the wider initiative ‘#BristolBrexit – A City Responds to Brexit’. Working closely with local residents, city officials, stakeholders, practitioners and charities in Bristol, the workshop sought to include a balance of participants between central Bristol and the outer estates. The workshop participants identified the challenges we face post-Brexit with a particular focus on Bristol, including the racism and prejudice faced by minority communities, ensuring the rights of EU citizens in the UK, and the general sense of insecurity and uncertainty brought on by the Referendum result. Built into the design of the workshop, the conversation then turned to ‘who is missing?’. Large segments of our local communities, including young people, abstainers, and Brexiteers are still missing from the Bristol-Brexit discussion. The #BristolBrexit initiative recognises Brexit’s challenges but also proposes interventions for moving forward. This requires overcoming the stereotypes and misunderstandings in what is a complex debate where both sides often misunderstand and talk past one another. The table below outlines some of the dominant and popular discourses to emerge about Remain and Leave voters, some more understanding and favourable than others. These are the narratives which appear to have emerged and is by no means a complete and accurate representation of all Leave and Remain voters. Brexit meant and continues to mean different things to different people. The referendum inevitably presented us with a binary choice: you were either Remain or Leave. But the way we move forward needs to go beyond dichotomies. How do Remainers see Leavers? How do Leavers see Remainers? Leave voters as white voters making the ‘irrational’ choice to Leave based on racial prejudice, pulling the nation into turmoil. The Brexit vote representing a regression in social attitudes and a racist attack on migrant rights and diversity in Britain. Remain voters as part of a liberal, university-educated, out-of-touch, metropolitan elite. Politically correct and comfortable with diversity and Europeanisation, they are able to take advantage of free movement and the ability to live and work anywhere within the EU. How do Leavers see themselves? How do Remainers see themselves? Leave voters are older, white, working-class men who have been ‘left behind’ by rapid social and economic processes supporting Brexit out of frustration with the EU and mass immigration. Remain voters rejected the intolerant and at times racist tone of the official Leave campaign. Support for Remain was based on progressive values including EU legislation on human rights, protection from discrimination and combatting climate change. 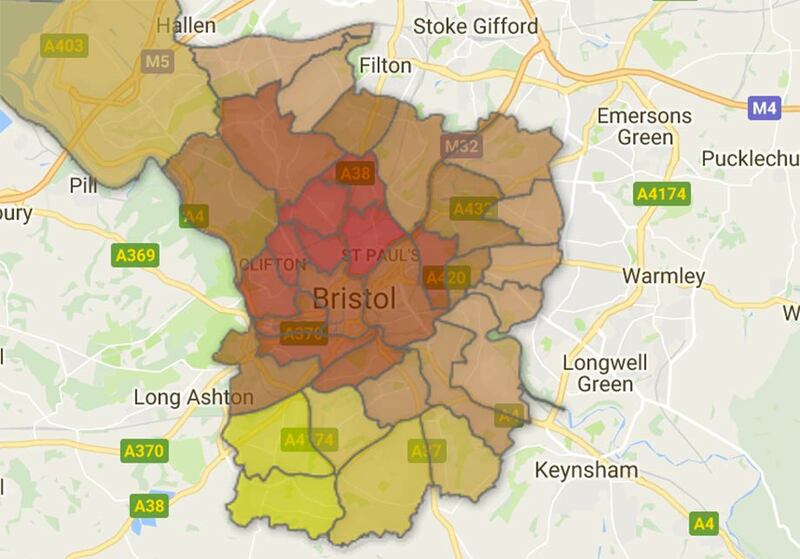 In understanding Bristol Brexiteers, the idea of a white, working class, ‘left-behind’ population resonates somewhat with the referendum vote mapping onto existing notions of Bristol as a ‘tale of two cities’. Prosperity and opportunity can be found in the trendy, leafy-green centre. However, the further outwards you go from the centre, the more you see a side of Bristol which is lesser known. In the largely white, working class outer estates, you’ll find some of the most deprived areas in the country, with low incomes and job prospects and low outcomes for health and education in what some have called ‘the land that time forgot’. This is where the Leave vote was strongest in Bristol. As one of our workshop participants, a Hartcliffe resident, put it: the Leave voters in his area were fed up of being ignored and forgotten and voted Leave to ‘stick two fingers up’ at politics. This frustration and resentment manifested in the referendum over what for them are very real concerns. What next for Bristol Brexit? The prospect of Brexit has brought with it challenges but also highlighted pre-existing tensions. The next step for #BristolBrexit has been to organise a public event, which will take place on 23 May. The event is organised to continue the discussion and collaboration between the city council, Bristol universities, local practitioners and residents but to also bring the wider public into the conversation. But these conversations are just the start. Our workshop also concluded with proposals for more co-produced and participatory research. This involves academic research going beyond the level of commentary and breaking out of the echo chamber to produce research in partnership with communities on their lived experiences and bringing in their perspectives. As part of these concrete steps forward, we need to move away from the polarised nature of the In/Out debate and resist further retreat and atomisation as a response to Brexit and the tensions it has brought to the surface. In this, ethnic minorities have largely been written out of the debate often only appearing as victims of hate crimes. However, the stereotype of ethnic minorities as (passive) victims of hate crime rather than active participants in the referendum is no more helpful than stigmatising the white, working class Brexiteer as making the ‘irrational’ choice to Leave based on racial prejudice. The picture of white, working class people voting for Leave out of frustration with increasing immigration and ethnic diversity is complicated by the fact that many people of ethnic minority background in the UK voted Leave. At the same time that residents in Hartcliffe expressed being isolated from the rest of the city, another workshop participant raised this point, “we always hear about the white working class as left-behind. What about the black working class?”. Bristol is becoming increasingly gentrified, seeing a sharp increase in homelessness and overall inequality. As Bristol makes sense of its colonial past, the city is the second worst place to be Black in England and Wales. Bristol’s BME communities have poorer job and health prospects and the fewest academic qualifications than those in white communities of the UK’s Core Cities. Rather than descend into a game of Oppression Olympics, as the workshop highlighted, feelings of pre- and post-Brexit insecurity and uncertainty, while experienced differently, are shared by many and transcend ethnic and class lines. For this reason, the workshop participants called for creating shared neighbourhood spaces to facilitate communication across divides. Other interventions were proposed to address the growing frustration amongst young people and those who are thrown by the divisive nature of the Brexit debate. Moreover, there were concerns that older and divisive constructs and understandings, for example of race, were being passed on to younger generations. We’ve seen this with with the growing far-right movement amongst young people in France, Generation Identitaire. Racism and other forms of prejudice are learned and not inherent to any particular group. The initiative will work to deliver workshops in schools on politics and society and lay the groundwork for more formal training to be provided in schools for young people to learn more about how to live with difference. The workshop participants called for a stronger emphasis on politics and citizenship in the compulsory school curriculum, particularly promoting understanding of political institutions, parties, voting systems, debates and issues. Together with greater investment in neighbourhood spaces and after-school clubs, the interventions put forward included investing in teacher training – particularly as part of the Postgraduate Certificate in Education – to enable educators to question and deconstruct their own prejudices. Brexit has radically altered the political terrain revealing a dis-United Kingdom and a disunited Bristol. Bristolian Banksy’s mural depicts a star on the European Union flag being struck away, possibly a reference to hard Brexit. Bristol may not speak with one voice but we must have our local voices heard in the Brexit process. Neema Begum is a PhD Researcher in Politics at the University of Bristol. Her research focuses on Black Asian Minority Ethnic voting behaviour in the 2016 EU Referendum, and the intersections of ethnicity, class and gender in influencing voting behaviour. She tweets @NeemaBegum. This entry was posted in brexit and tagged #BristolBrexit, brexit, Bristol, colonial past, EU citizens, Leavers, Remainers, uncertainty, working class by policybristol. Bookmark the permalink.